Nissan is adding factory capacity for the 2013 Altima at both Smyrna, above, and the model's second North American production site in Canton, Miss. 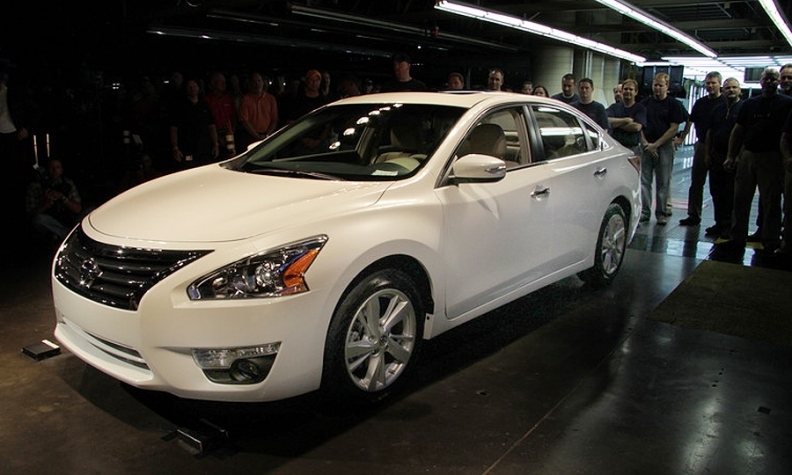 SMYRNA, Tenn. -- Nissan North America began production here Tuesday of the redesigned 2013 Altima sedan that it hopes will challenge the family-sedan supremacy of the Toyota Camry. "We didn't put all of the investment into this product and put in all the features with an expectation to be No. 2," said Bill Krueger, vice chairman of Nissan Americas, after the first 2013 model rolled off the line in Smyrna, Tenn. "Ultimately the consumer's going to vote with their purchase whether or not we sell more than anyone else." The Altima has lagged for most of its 20-year life as the also-ran among family sedans. But in the months following the March 2011 earthquake in Japan, it leapt into the segment's No. 2 spot, bypassing the Honda Accord and nipping closely at the market leading Camry. With both competitors now looking to reclaim lost ground, Nissan wants to capitalize on the gains. The 2013 redesign boasts segment-leading fuel economy and vehicle weight. But other challengers are also hot for more of the mid-sized sedan segment, including the big-selling Hyundai Sonata and a trio of cars that are redesigned for 2013 model year – the Honda Accord, Ford Fusion and Chevrolet Malibu. Krueger said that product enhancements will sell the Altima and he does not intend to raise incentives on it. "I'm willing to build demand by putting value out in the market place. But I'm not willing to cut and trim profit margin to try and beat a number that one of our competitors is doing," he said. "We don't have any intention of piling incentives on it to try to chase a number." Nissan is adding factory capacity for the Altima at both Smyrna and the model's second North American production site in Canton, Miss. Smyrna is hiring 1,000 workers in order to add a third production shift later this year, and managers are also taking steps to increase assembly line speed in Canton to add 20 percent more output there. Krueger remained cagey about how many Altimas Nissan North America will build this year, or how many Nissan will be capable of building once the changes are made. Both plants are highly flexible and can shuffle output from one model to another with minimal effort. The question is not academic. Both Toyota and Honda have enough factory capacity to outsell the Altima if the market demands it. Krueger told Automotive News several weeks ago that he will build as many Altimas as the market demands. In March, the company sold 41,000 2012-model Altimas -- a theoretical volume of nearly 500,000 if that pace kept up for 12 months. Nissan officials relish telling audiences that the Altima has been performing at that new level even though it is at the end of its model cycle. Even after starting production of the 2013 in Smyrna Tuesday, Nissan intends to go on building 2012-model Altimas for another month in Mississippi to satisfy demand for the outgoing version. But all of Nissan factory gains might not translate into more Altima sales volume. Krueger and his U.S. managers are simultaneously integrating new models into the U.S. plant lineup for the coming year. Smyrna will begin building the Leaf this December, and the high-volume Rogue crossover a year from now. Nissan intends to make 150,000 units of factory capacity available to each of those models.